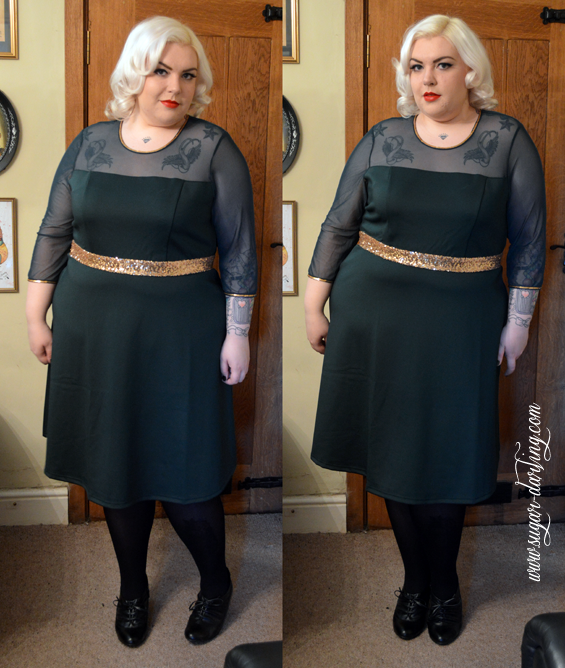 Glitz and Green - An Outfit Post - Sugar, Darling? So this year I have for some reason developed a serious love for deep forest and emerald greens. I've collected nail polishes, jewellery pieces and accessories but just haven't found that perfect deep green dress for Christmas day. Then, I got an email from the lovely Jay at Fashion World asking if I'd like to review a piece from the site, and I came across this beauty. This dress is a fit and flare style which I really like as it shows off your assets up top but then flares out into a flattering fuller skirt at the bottom covering up my tummy and thigh areas. A lot of the time these styles sit well above the knee on me as I have a fairly long torso, but this one is just perfect sitting just under the knee. It features micro mesh for the 3/4 length sleeves and upper chest area with a nice round neck, both of which are trimmed in pretty gold sequins which are used in full force in the lovely waist band which continues around your back. I do love a bit of glitz on a Christmas dress as you well know! 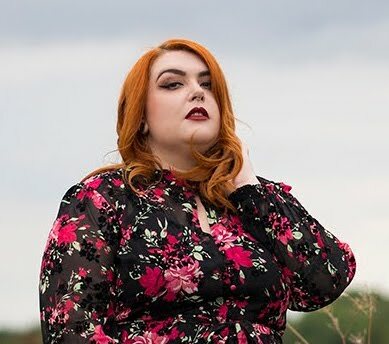 The fabric forming the main body of the dress is of a lovely weight/thickness so there's not much risk of 'pulling a Marilyn' if you get caught in a gust of wind and it has some stretch to it too so there's no need to worry if you have a bigger bust, although you will need a strapless bra here ladies! There is also a keyhole detail at the back of the neck and a very nice gold exposed zip detail which me being a silly forgot to photograph, but like I said, it is lovely. The photo of the dress on the website doesn't seem to show the sequins on the sleeves, but they're a nice touch too. I think this really is one of those perfect festive party dresses. 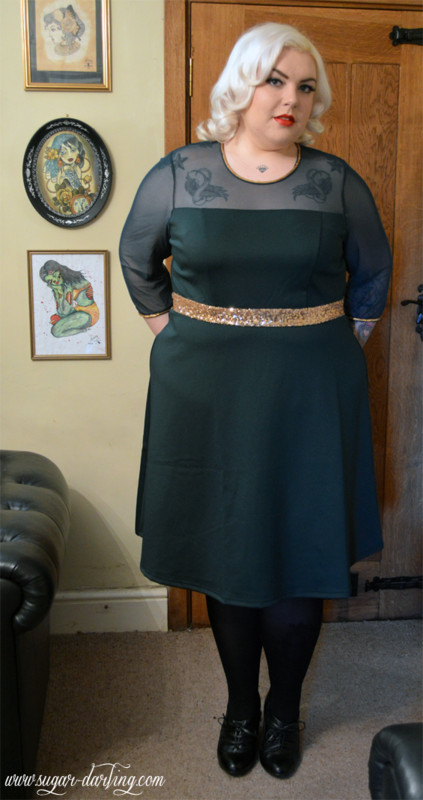 It encompasses glitz and glamour with a classic Christmas colour palette of deep green and gold, and it has a flared skirt to hide your 'I've just eaten a flipping massive roast dinner' tummy so you can feel confident that you look lovely all night long. Don't forget the santa red lipstick now! 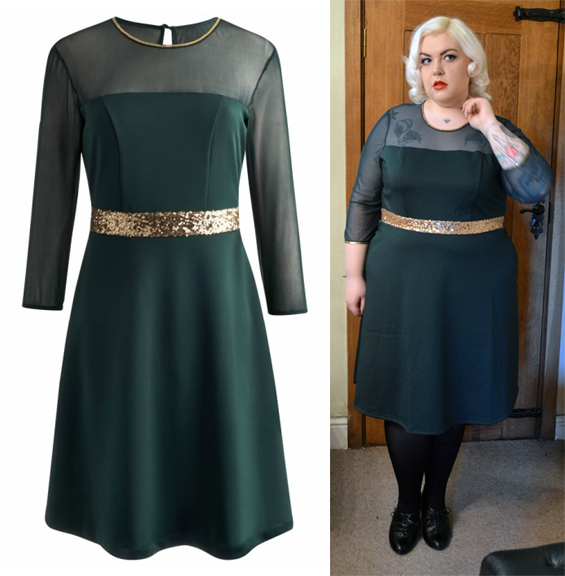 You can buy this beautiful dress here but be quick, it looks like it's selling out fast! If you know of any other deep green dresses do link me to them, I'd like to start a collection!! !